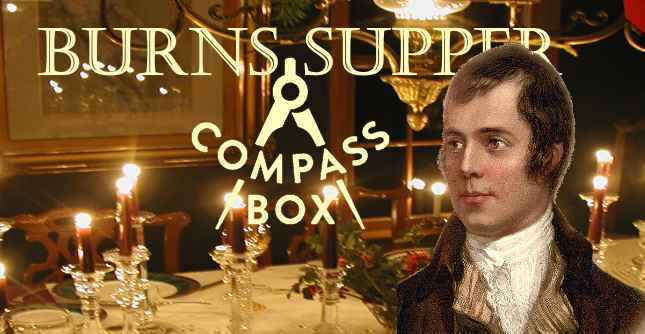 Burns Supper, like Easter, is arriving late this year. Please join us for this weekend for Supper, Haggis, good poems, bad poems, and a lot of great scotch. This year, one of San Diego’s favorite non-distilleries will be presenting, Compass Box. This independent blender takes scotch from all over Scotland and makes it into something special. Scott Ellis will be our special guest host and he will be on hand to pour TEN Compass Box drams. Bring your kilts and be ready for Burns supper traditions such as haggis, the address to the haggis, supper, good poetry, bad poetry, and GREAT Scotch. w/ citrus beurre Blanca sauce. Filet Beef Bourguignon, Seasonal vegetables red wine cream sauce, penne pasta, fresh herbs. 8oz New York steak, celery root mashed potatoes, roasted garlic brussels sprouts, topped w/ blue cheese, fried onions.